Simon & Schuster, 9781416544937, 426pp. 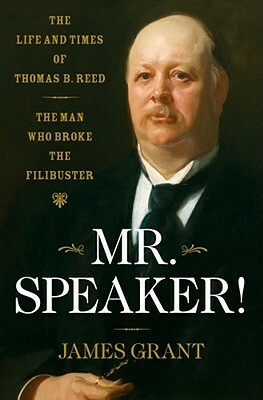 James Grant's enthralling biography of Thomas B. Reed, Speaker of the House during one of the most turbulent times in American history--the Gilded Age, the decades before the ascension of reformer President Theodore Roosevelt--brings to life one of the brightest, wittiest, and most consequential political stars in our history. The Speaker's beliefs in majority rule were put to the test in 1898, when the sinking of the U.S.S. Maine in Havana Harbor set up a popular clamor for war against Spain. Reed resigned from Congress in protest. A larger-than-life character, Reed checks every box of the ideal biographical subject. He is an important and significant figure. He changed forever the way the House of Representatives does its business. He was funny and irreverent. He is, in short, great company. "What I most admire about you, Theodore," Reed once remarked to his earnest young prot g , Teddy Roosevelt, "is your original discovery of the Ten Commandments." After he resigned his seat, Reed practiced law in New York. He was successful. He also found a soul mate in the legendary Mark Twain. They admired one another's mordant wit. Grant's lively and erudite narrative of this tumultuous era--the raucous late nineteenth and early twentieth centuries--is a gripping portrait of a United States poised to burst its bounds and of the men who were defining it.